We have some gorgeous captive bred baby concentric diamondback terrapin for sale as well as well started 6 month old baby diamondback terrapins for sale. 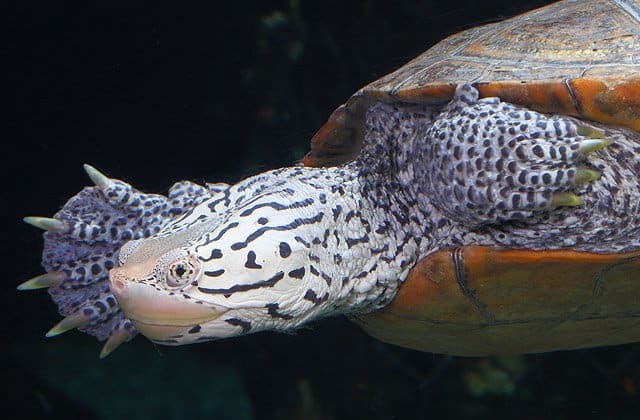 Concentric Diamond-back terrapins are turtles with concentric, diamond-shaped markings and grooves on the scutes (plates) of their carapaces (top shells), which range from medium gray or brown to nearly black. When choosing any diamondback terrapin for sale or any turtle for sale it is important that you purchase a healthy animal from an experienced turtle breeder. 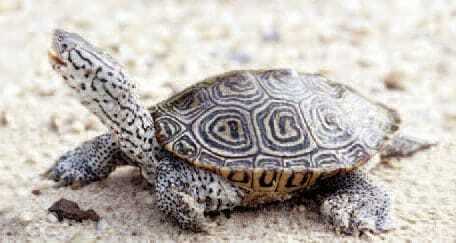 Captive bred diamondback terrapin babies for sale should always be purchased over a wild caught adults when possible. With a biologist ON SITE, our diamondback terrapin for sale are top notch and ready to ship to you via FedEx Overnight in heated or cooled, insulated shipping boxes and come with our live arrival and full 7 day health guarantee. One shipping charge covers up to 4 turtles or tortoises.